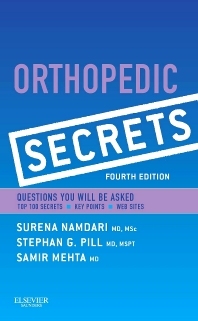 Quickly reference the answers you need to the most important clinical questions in orthopedics with Orthopedic Secrets. Fully updated throughout, this classic medical reference book covers the entire range of essential topics in orthopedics, organized by subspecialty, for rapid access to the knowledge you need for success both in practice and on board and recertification exams. Zero in on key orthopedic information with a question-and-answer format, bulleted lists, mnemonics, and practical tips from the authors. Enhance your reference power with a two-color page layout, "Key Points" boxes, and lists of useful websites. Review essential material efficiently with a "Top 100 Secrets" chapter, perfect for last-minute study or self-assessment. Keep it close. A pocket-sized design makes this title easy to fit in your lab coat pocket!